Finishing your basement can seem like a daunting task, a trusted remodeling company makes it easy. Take a look at this newly finished basement, it features a beautifully constructed layout & design. Are you going to be required to meet new building requirements for your project? Do you have a builder & designer who can plan & coordinate your building requirements & design needs? If not, consider the amount of money you are investing into your home & what could happen if you don’t work with a trusted company. Consider & research different flooring and ceiling options so your designer can choose the best fit for your homes needs. Options such as laminate flooring, can save you money and expand the functionality of the space. The basement layout and lighting placements are going to directly influence the overall feel of the space. Having a bad layout can create unwanted and unusable areas. Room placement in a basement is important! So the placement of a bathroom, closet, or bar can impact the use of space heavily. Consider walkways, door openings, and how you will be using the space when its completed. We do it all for you, with your input too of course! Having a trusted company to plan & coordinate a project is a crucial competent of remodeling. The trusted company will take care of the dirty work so you don't need to worry about things like city codes, inspections, layout design, & more. 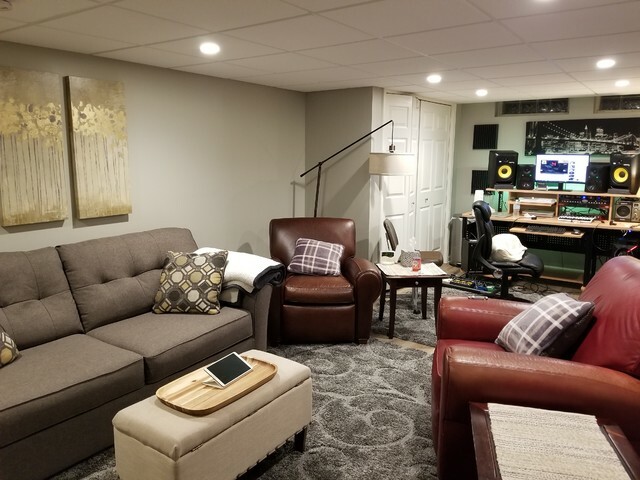 Remember to consider your homes needs in regards to storage space, durable surfaces, bathroom accommodations, & functionality when it comes to your basement remodeling project. Get your project started today!